Because the Question manager is designed to be intuitive (with hints along the way), there are certain aspects we don’t really need to cover here. To learn the basics, the best thing is to dive straight in and build a Keypad round. 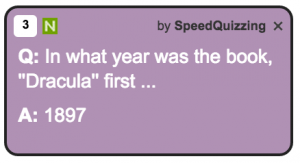 Note: You need to have purchased SpeedQuizzing Activations within the past 12 months to get the full benefit of the Question manager. 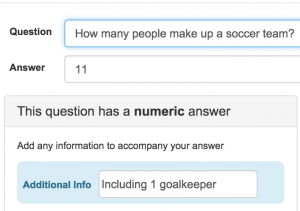 If you haven’t, then the amount of questions you can export in a round will be limited to 4. Click New Question and type in a quiz question which you think will work as a first letter of the answer question. Now hit Tab on your computer keyboard and input the full answer in the answer box. 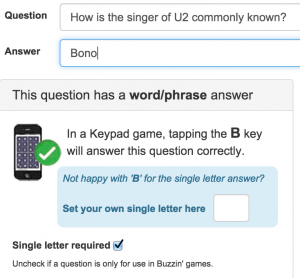 As you can see in the image below, the letter B for Bono has automatically been assigned as the first letter of the answer to the question. If you are happy with this choice of letter you simply click Save Changes. However, in rare occasions, you may want to set your own single letter answer. For example “What is the 10th letter in the word “Constantinople“? In which case you’d want to input your own single letter as “N”. The only time you would uncheck the “Single letter required” checkbox would be if this question was to be used as a Buzzin‘ only question. Now create a Multiple Choice question. Click New Question and type in a quiz question. Now hit Tab, twice on your computer keyboard (skipping the answer box) to start entering Multiple Choice options. Once you have inputted the options (between 2 and 6) you should click the corresponding button, indicating which of the options is correct. You then have the option of inputting Additional info. The Additional info is optional. 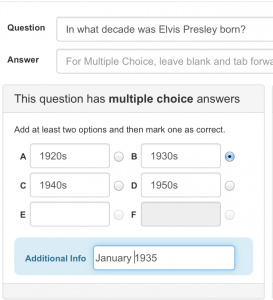 Click New Question and type in a quiz question which will require a number for the answer. Now hit Tab on your computer keyboard and input the numeric answer. As you can see in the image below, it has been recognised as a number question and additional info can be added if required. Save Changes. when ready. You must now drag each question one at a time from the organiser section onto the red Keypad tab. Then click on the Keypad Tab to view the round and also reorder the questions by dragging and dropping. 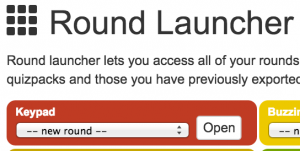 Multiple rounds of the same or different types can be launched allowing you to drag questions between rounds. User Questions (Blue) can be re-edited by double clicking the question. Before you go any further using the online Question Manager it is helpful if you understand the different game formats and question types. If you are only using Keypad rounds then it is quite simple to understand, simply choosing between Multiple choice, Letters or Numbers questions. However, what is great about the Question manager is that when you create a new question it not only asks what type of quiz-round you intend to include it in, but it also allows you to categorise which other types of round it will be compatible with for future use. Multiple Choice and Nearest Wins questions are exceptions to this as they can not be used in any other round-type. Generally a question created as a Letters Question or Numbers question will also work in a Buzzin’ round. 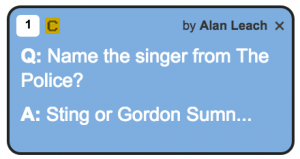 Likewise a Buzzin’ question will usually be compatible with either a Letters Question or a Numbers question, but not always. It is even possible to have a question which might work well as a Buzzin’ Classic question, but may cause problems if you read it out in a Buzzin’ Advanced round. That is why each saved question has little coloured codes in the corner stating which type of question format it is compatible with. M = Multiple Choice, L = Letters, N = Numbers, N = Nearest Wins, C = Buzzin’ Classic, and A = Buzzin’ Advanced. Therefore a question which is labeled LCA can be used as a Letters question, a Buzzin’ Classic question or a Buzzin’ Advanced question. Here are some examples of the different types of questions. 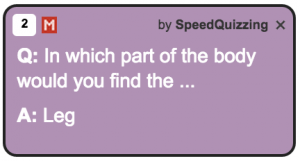 Note that a blue question indicates a user created question and a pink question indicates that it is a question which has been purchased as part of a SpeedQuizzing Quizpack. A blue question can be re-edited by double clicking it. A pink one however can’t. Here is an example of a question which will only work in a Keypad round since it is a Multiple Choice Question indicated by the letter M.
Here is an example of a Nearest Wins question indicated by the letter N.
Here is an example of a question which (because the first letter of the answer is given away in the question), it wouldn’t work as a Letters Question so it would have the CA code making it compatible with Buzzin’ Classic and Buzzin’ Advanced rounds. 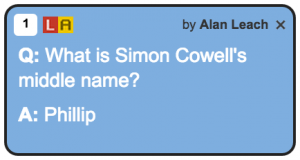 Here is an example of a question which would work as a Buzzin’ Classic or a Letters Question but (because there is more than one possible answer) it should be avoided as a Buzzin’ Advanced question and therefore has the code LC for Letters and Buzzin’ Classic compatibility. 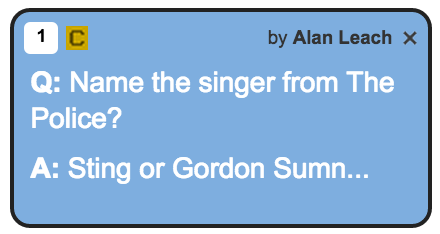 Here is an example of a question which would only work as a Buzzin’ Classic question. Because there is more than one possible answer and they both start with different letters, it should be avoided as a Buzzin’ Advanced question or a Letters Question. Therefore it has the code C for Buzzin’ Classic. Here is an example of a difficult question which people might be inclined to have a guess at but with little chance of someone guessing it right. 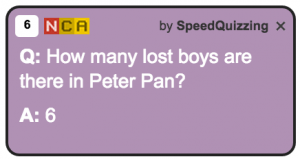 So although it could have an LCA code, you might choose to avoid using it in a Buzzin’ Classic because this type of question can have the host excessively running around marking answers incorrect when used in a Buzzin Classic round. Therefore to avoid this, it has been given an LA code for Letters and Buzzin Advanced compatibility only. Note: If you have no intention of hosting Buzzin’ Classic or Buzzin’ Advanced questions in the future then all you really need to take note of is the red and green icons (for Keypad and Nearest Wins) and you can ignore the orange and yellow Buzzin‘ icons.